Well, there are several tools available online that will help you in counting your article’s social share among many popular social networks and bookmarking website. Shared Content is the most popular service bloggers, internet marketers and advertisers use to track performance of their article, review and campaign on social network. 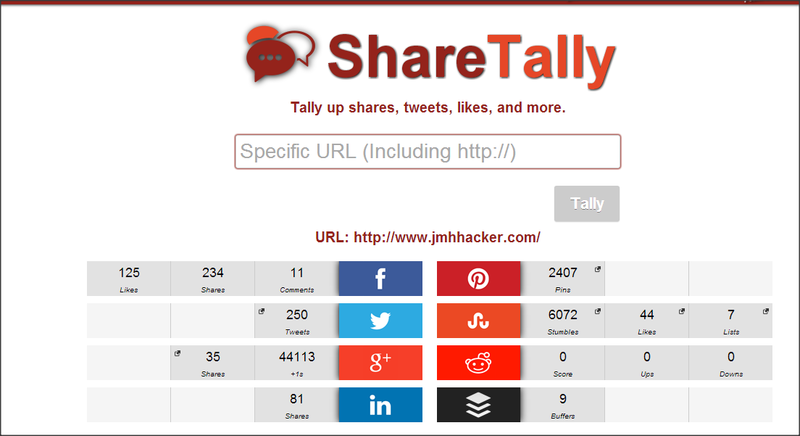 This tool will automatically scan the URL at various social networks and tell you how much shares, tweets, +1, etc. your article got. It tells Facebook likes, shares, comments, Twitter tweets, Google+ +1s, LinkedIn shares, Pinterest Pins, Delicious and StumbleUpon bookmarks. 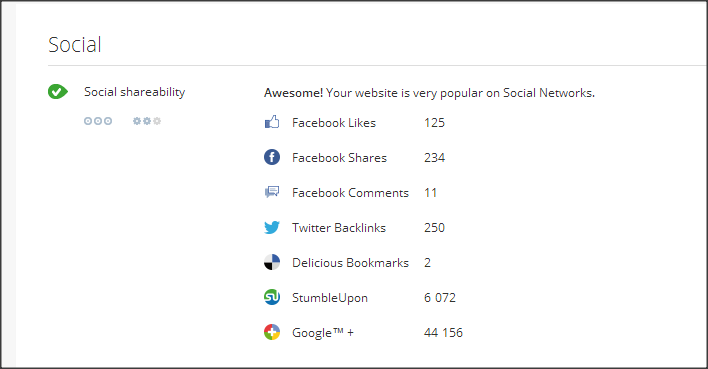 How Many Shares is another similar web tool that lets you to check out social popularity of any webpage by entering its URL. When you enter URL of any article at the provided text-box, How Many Shares open a pop-up window telling you how many Facebook Likes,Facebook Shares, Facebook Comments, Twitter Tweets, Google+ +1s, LinkedIn Shares, Stumbles, Delicious bookmarking has been done for the article/URL. Here are my results for my main domain (http://www.jmhhacker.com) you can do it for each article. 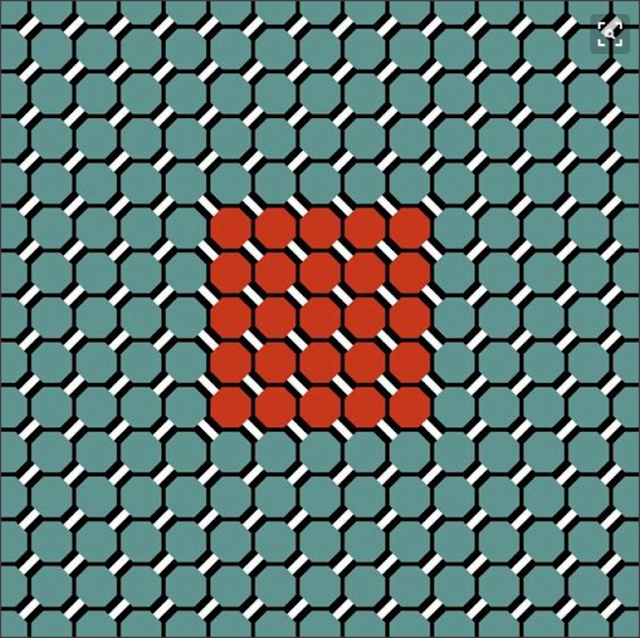 Very powerful. In comparison to other social shares counting tools, it provides social share statistics from many other services, while telling you social shares from most popular social media and bookmarking websites too. Facebook, Google+, Twitter, StumbleUpon shares, you can also check shares on Reddit, Buffer, Scoop.it, Hackers News, Pocket, and many other services. 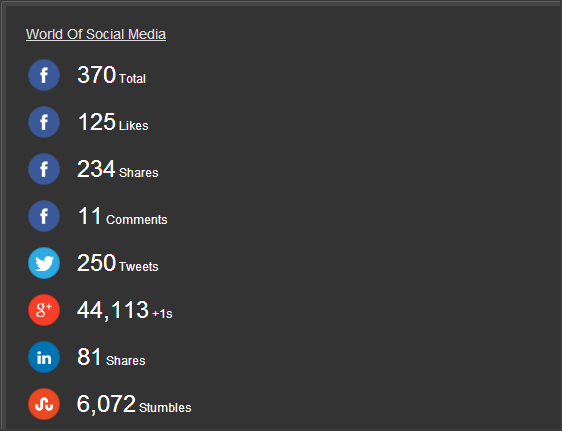 Another very simple though powerful service to count social share of a website. This service covers very few but all important social media platform and bookmarking websites that you are primarily concern about. 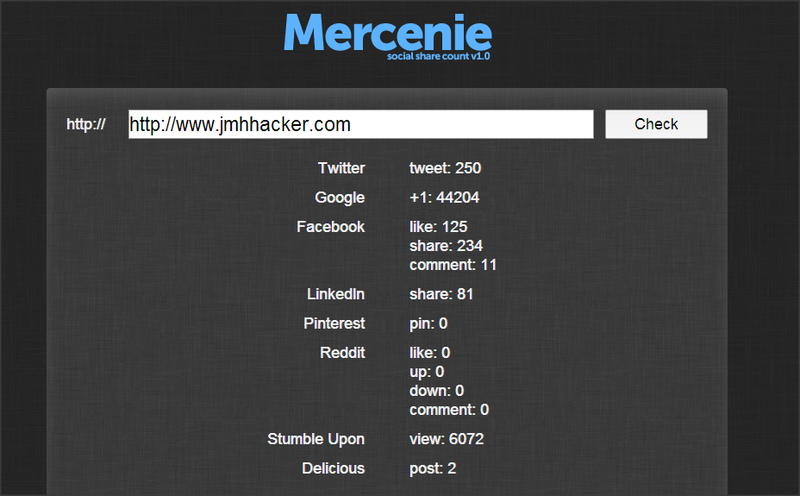 Just enter your article’s URL and click on “Check” button, Mercenie Social Share Count will automatically count your article’s activity on Twitter, Facebook, Google+, LinkedIn, Pinterest, Reddit, StumbleUpon and Delicious. 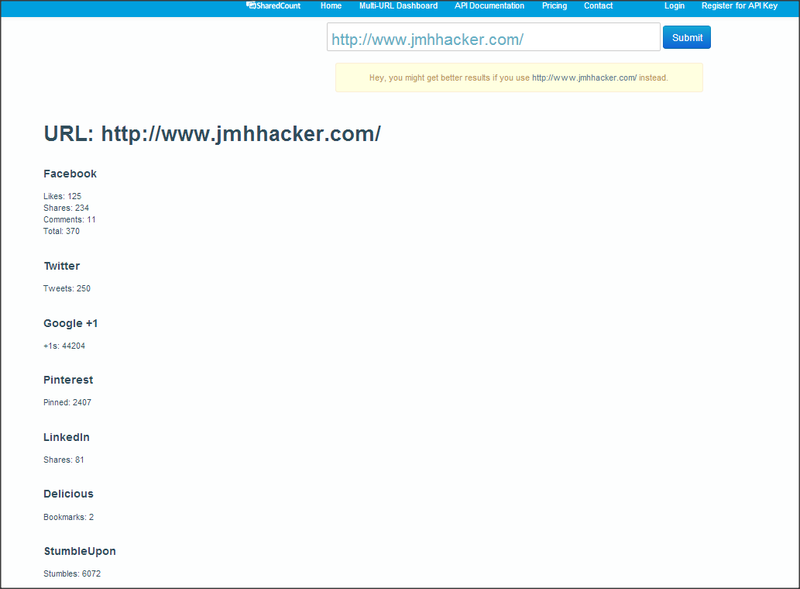 Also use Mercenie /seo/moz-checker/ for Domain Authority, Page authority and more. Enjoy these tools as I have and it will show you where you need to improve!